Malignancies involving upper aerodigestive tract remain a challenging problem for surgeon and extent of resection remains controversial. More so when cricoid cartilage is additionally involved, a total laryngectomy is preferred most often. However, this might reduce the quality of life of the patient, thus warranting a conservative approach such as cricotracheal resection (CTR) and anastomosis. 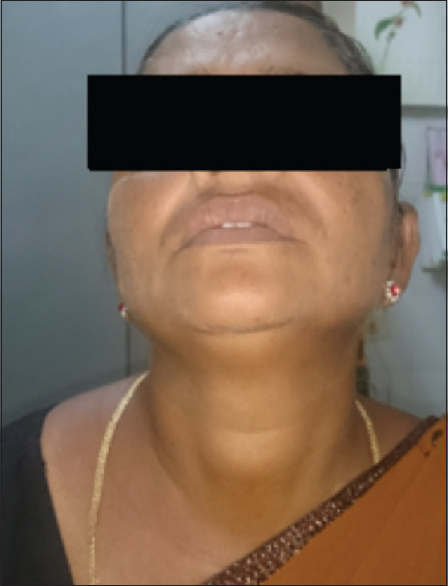 A 56-year-old female presented with complaints of dyspnea, blood-stained sputum, and swelling in front of neck for 2 months [Figure 1]. CT scan showed thyroid mass with tracheal and cricoid cartilage infiltration [Figure 2]. On presentation, she had stridor, which warranted emergency tracheostomy. Fine-needle aspiration cytology from lesion was papillary carcinoma thyroid (PCT). Magnetic resonance imaging [Figure 3] showed 40 mm × 18 mm lesion replacing isthmus of thyroid and infiltrating anterior and right lateral aspect of the trachea and cricoid cartilage with significant luminal narrowing. No significantly enlarged neck nodes were noted. Flexible endoscopy showed mobile vocal cords and a reddish subglottic mass. 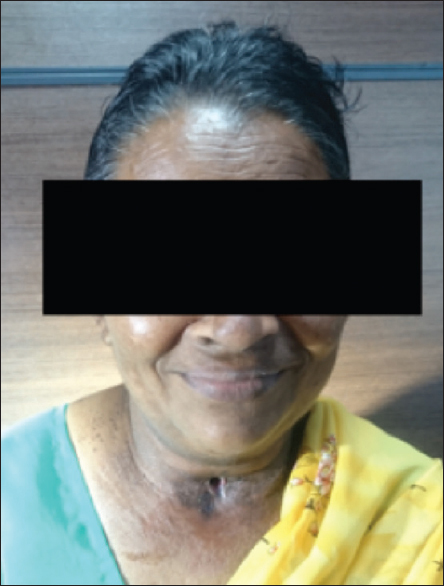 She was planned for optimal surgery under frozen control, with consent for total laryngectomy. On examination, tracheostomy tube was in situ and a 4 cm × 4 cm mass was palpable in the isthmus region of thyroid and it was fixed. 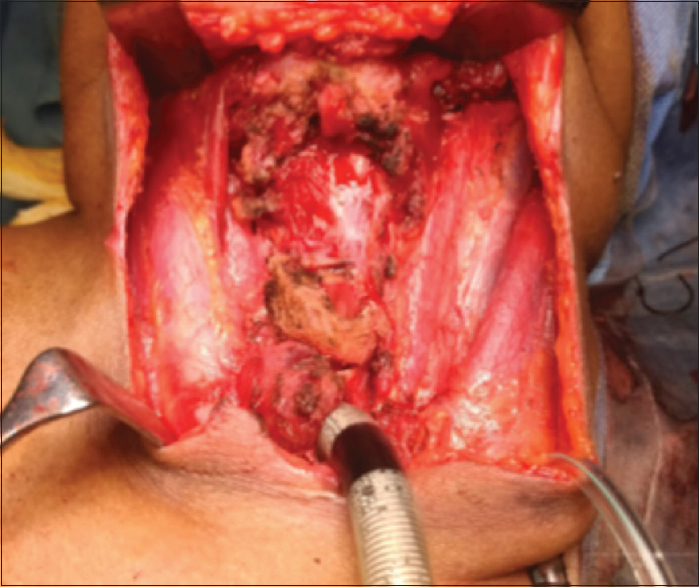 Total thyroidectomy with neck dissection and CTR followed by thyrotracheal anastomosis was carried out [Figure 4]. Tracheostoma was refashioned without any sacrifice of additional trachea cartilaginous rings, and tracheostomy tube was placed. Intraoperatively, thyroid mass was infiltrating to underlying upper three tracheal rings and cricoid cartilage. There were few enlarged lymph left Level II nodes. 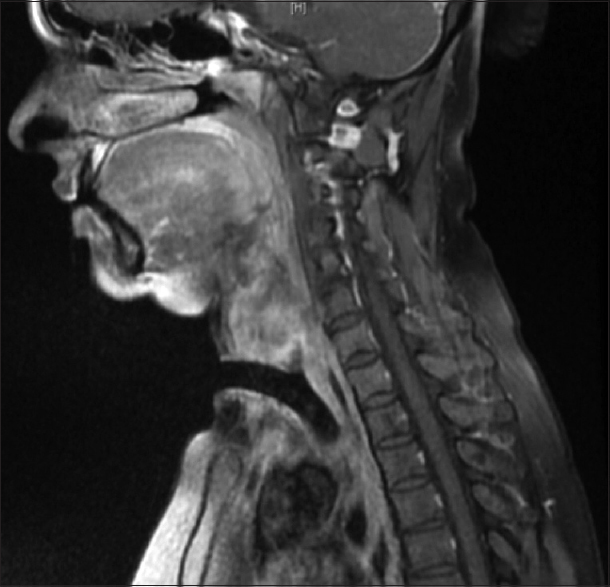 Recurrent laryngeal nerves and parathyroids were identified and preserved. Following surgery, the patient was kept with neck flexion with chin-to-chest “guardian” sutures, for 14 days. She was able to take food orally and able to speak by occluding tracheostomy tube, at the time of discharge. We were not able to decannulate her because of persistent subglottic narrowing. She was given adjuvant radiotherapy 60 Gy in 30 fractions, 2 months after the procedure. She is on regular follow-up for the past 1 year with no further disease [Figure 5]. Tumor invasion through trachea was staged according to Shin et al., in which Stage I includes lesion which extends through the thyroid capsule and abuts the airway external perichondrium; Stage II, it destroys the cartilage or penetrates between the tracheal rings; Stage III, it extends through the cartilage or between the tracheal rings into the lamina propria of the tracheal mucosa, without its invasion; Stage IV, it penetrates the entire thickness of the tracheal wall, presenting inside the airway with ulceration or nodules. Piazza et al. showed all three patients with previous radiotherapy who underwent TRA/CTRA experienced major complications. Similar complication was also found by Ch'ng et al., who suggested that four tracheal rings (around 2 cm) are the maximum limit for segmental resection and primary anastomosis. It is quite possible that radiotherapy might be a contributing factor preventing decannulation of our patient, although she is able to phonate and able to swallow with ease. The surgery of choice for locally advanced DTC with infiltration into airway should always include attempts to preserve speech, airway, and swallowing. Proper selection of patient, meticulous surgery, and careful postoperative management are mandatory to maximize the functional outcome and quality of life. Musholt TJ, Musholt PB, Behrend M, Raab R, Scheumann GF, Klempnauer J, et al. Invasive differentiated thyroid carcinoma: Tracheal resection and reconstruction procedures in the hands of the endocrine surgeon. Surgery 1999;126:1078-87. Peng A, Li Y, Yang X, Xiao Z, Tang Q, Wang Q, et al. A review of the management and prognosis of thyroid carcinoma with tracheal invasion. Eur Arch Otorhinolaryngol 2015;272:1833-43. Chernichenko N, Shaha AR. Role of tracheal resection in thyroid cancer. Curr Opin Oncol 2012;24:29-34. Nishida T, Nakao K, Hamaji M. Differentiated thyroid carcinoma with airway invasion: Indication for tracheal resection based on the extent of cancer invasion. J Thorac Cardiovasc Surg 1997;114:84-92. Piazza C, Del Bon F, Barbieri D, Grazioli P, Paderno A, Perotti P, et al. Tracheal and crico-tracheal resection and anastomosis for malignancies involving the thyroid gland and the airway. Ann Otol Rhinol Laryngol 2016;125:97-104. McCarty TM, Kuhn JA, Williams WL Jr., Ellenhorn JD, O'Brien JC, Preskitt JT, et al. Surgical management of thyroid cancer invading the airway. Ann Surg Oncol 1997;4:403-8. Honings J, Stephen AE, Marres HA, Gaissert HA. The management of thyroid carcinoma invading the larynx or trachea. Laryngoscope 2010;120:682-9. Piazza C, Del Bon F, Paderno A, Grazioli P, Mangili S, Lombardi D, et al. Complications after tracheal and cricotracheal resection and anastomosis for inflammatory and neoplastic stenoses. Ann Otol Rhinol Laryngol 2014;123:798-804. Czaja JM, McCaffrey TV. The surgical management of laryngotracheal invasion by well-differentiated papillary thyroid carcinoma. Arch Otolaryngol Head Neck Surg 1997;123:484-90. Piazza C, Bolzoni A, Peretti G, Antonelli AR. Thyroid metastasis from rectal adenocarcinoma involving the airway treated by crico-tracheal resection and anastomosis: The role of palliative surgery. Eur Arch Otorhinolaryngol Head Neck 2004;261:469-72.